One of the best things about watching kids grow up is learning about their preferences. Finley has quite the affinity for monkeys... this could be because we made him dress up as one for his first Halloween... or that they are plastered all over his nursery... or that he has at least five stuffed monkeys... but I like to think that he decided to like monkeys all on his own. He insisted on taking all of these monkeys down the slide with him. Just like he insists on holding all of the monkeys in his crib when he's going to sleep. He's such a silly kid. We got new baby two stuffed lions just like Finley's favorite monkey, so I guess that next child is doomed to like lions. It's also worth mentioning that Finley refuses to say "monkey" even though he can say "mama" and lots of other M words. When he wants his monkeys (and as he saw me writing this post) he says "eee eee oooh oooh aaah aaah aaah." And since none of the monkeys have names, we might just name them "Ee" "Oo" and "Aa" like the monkeys on the Disney Channel. I'm happy that I gave him one of those monkeys. Discuss away... I've decided that I don't mind him being mistake for a girl until he understands that he is not a girl. Gotta love the monkeys!! Especially the sock monkey! 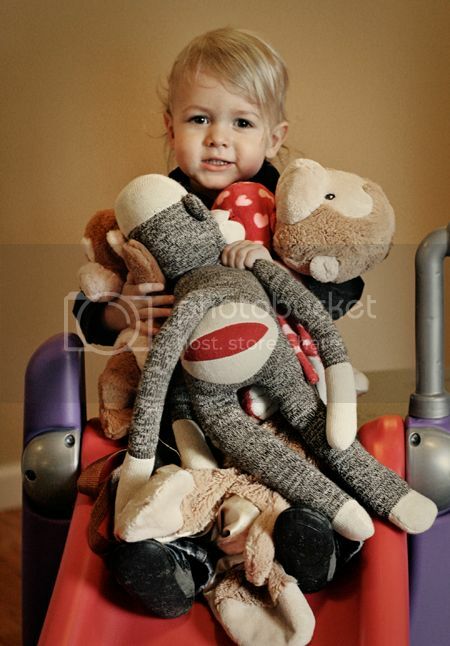 so cute - he loves his monkeys!! I think Finley needs this t-shirt! No, not lions...pumpkins : } goes much better with monkeys! !